This story originally appeared on June 4, 2013. Sometime in the spring of 2012, Al Bunting received a message imploring him to publicly endorse America’s warplane of the future. Bunting, a retired senior Air Force officer and administrator for the tiny New Jersey coastal town of Sea Girt, was not alone. Across the Garden State in 2011 and 2012, government officials, political organizers and even religious leaders received similar messages, all asking for the recipient to speak out on behalf of Lockheed Martin’s F-35 Joint Strike Fighter, meant to replace thousands of existing U.S. warplanes at an immediate cost of more than $400 billion. The plane had run into serious technical problems that heaped cost and delays onto the program, and needed a public boost. The messages were just one facet of a high-stakes public relations campaign, paid for by Lockheed Martin and overseen by an interlocking network of powerful PR firms. The paid, pro-F-35 advocacy also involved, to some extent, a mysterious blog with access to suspiciously high levels of F-35 testing data. The message to Bunting worked. The retired officer endorsed the F-35, despite the jet’s problems. So did the New Jersey state assembly, in a June 2011 resolution calling on the U.S. Congress to fully fund the F-35. The resolution, supported by lawmakers who had received funds from Lockheed’s P.R. reps, used language provided by the reps. Despite more than a decade of tortured development that has seen repeated delays, cost increases, performance downgrades and groundings owing to technical flaws, the F-35—history’s priciest weapons program—survives and even thrives, continuing to receive no less than $10 billion a year from a cash-strapped Pentagon. Lockheed’s P.R. efforts no doubt help protect the Joint Strike Fighter. As Bunting’s story shows, those efforts run deep, reaching into unlikely dens of state politics, far outside the Pentagon or the Capitol, and the obscure warrens of the internet. Piecing together the endorsement requests, government lobbying, donations and pro-F-35 blogs helps explain how the much-criticized F-35 stays flying. In any event, Bunting agreed to look into the new warplane and consider endorsing it. Bunting, a local government official, stressed that he did his research on his own time and received no compensation. When I called him at his Sea Girt administrative office, he even said he would spend an extra few minutes at work to make up for the time he was spending talking to me. “It was on the up and up,” he said of his interaction with Dickerson. 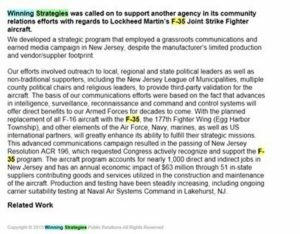 In 2011, Winning Strategies approached members of the New Jersey assembly with the same claims Bunting had parroted in his letters to the editor: that the F-35 was the best replacement for New Jersey’s F-16s. That the new warplane program would feed many tens of millions of dollars per year into the state economy and support 1,000 jobs. 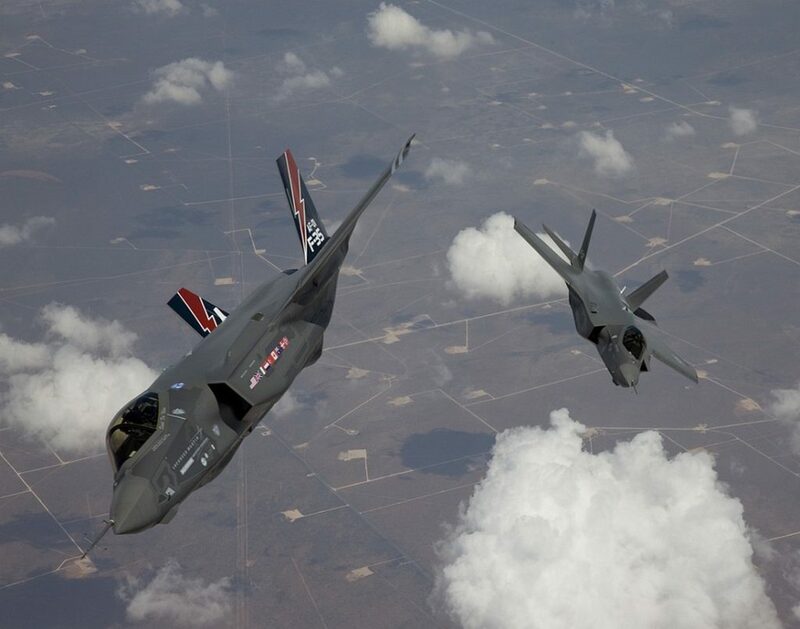 In June of that year, 73 members of the assembly voted in favor of ACR 196, a non-binding resolution “memorializ[ing] Congress to recognize [the] importance of F-35 aircraft and support full funding of F-35 Lightning II Joint Strike Fighter Program.” Six members did not vote. No one voted against it. The resolution uses the exact same numbers and phrasing. Several members of the New Jersey assembly have received funds from Winning Strategies or directly from employees of the firm. Rep. Paul Moriarty voted for ACR 196: he received $5,200 from Winning Strategies in 2005. Rep. Louis Greenwald also voted in favor; Winning Strategies gave him $1,000 in 2004. Winning Strategies and its employees have given more than $10,000 to statewide political committees since the F-35 program began in 2002. Winning Strategies’ national influence, via its Washington, D.C. branch, is far greater. It’s made lobbying and political contributions totaling $1.2 million since 2002, spent mostly on national legislators from New Jersey. Moriarty told me he does not know who Winning Strategy is. There is “no connection” between the firm, its contributions and his “yes” vote on ACR 196, which he stressed had unanimous support. “I don’t vote for anything based on what a lobbyist or P.R. firm says,” Moriarty said. 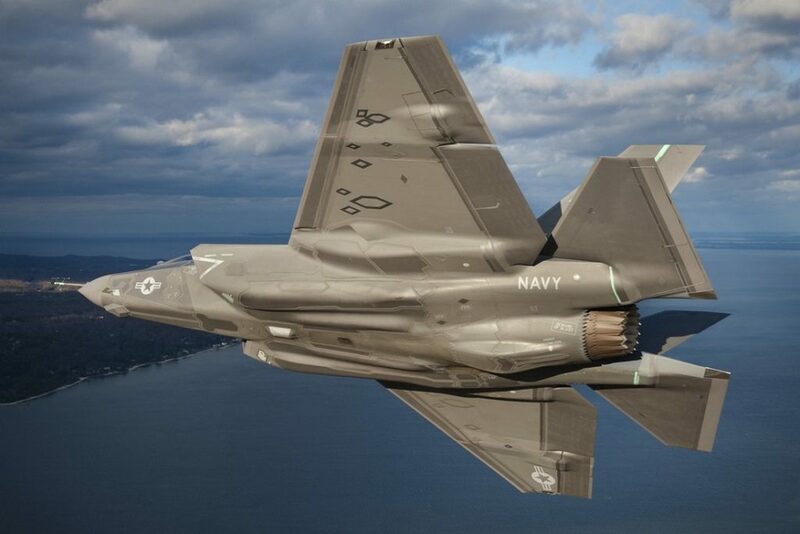 It’s not clear if Winning Strategies is still involved in promoting the F-35 in New Jersey. The company website referred to its work for Lockheed Martin in the past tense. But Lockheed’s P.R. and lobbying efforts in support of its biggest (and arguably most troubled) program continue through other means. The company spends $15 million a year on lobbying and additional millions in direct contributions to candidates and political committees. At the opposite end of the influence spectrum, Lockheed tries to shape the online conversation about the F-35, indirectly adding its voice to the sometimes chaotic back-and-forth between aviation enthusiasts, pilots, engineers, academics and journalists on blogs and Internet forums and in the comment sections of news stories. In the summer of 2012 reporters in the defense trade press received emails from someone named Sarah Santucci. The messages announced supposed good news about the F-35 and, as proof, linked to a blog. The Villageous website also describes Santucci as a former employee of the DCI Group, a P.R. firm with offices in Washington, D.C., Houston and Brussels. DCI Group has ties to Winning Strategies. In 2011 and 2012 Winning Strategies paid DCI Group a total of $50,000 for lobbying. There’s nothing unusual or sinister about P.R. reps sending emails to reporters. But the blog Santucci encouraged reporters to check out was both sinister and very strange. Graff’s Blogspot profile is essentially blank. The email address he lists is inactive. A Twitter account linked to the blog has 6,100 Tweets attributed to it—every one of them about the F-35. A Google search for the term “Barry Graff” turns up businessmen in San Diego and New York City but no one with any association to, or interest in, the F-35. “Why the F-35?” links to just three other websites: two other pro-F-35 blogs and the official website of the Joint Strike Fighter program. Graff occasionally comments on news stories about the F-35 and also participates in internet forum discussions, always defending the new jet. Graff did not respond to messages sent via email and Twitter. Villageous did not respond to email and phone messages. Santucci did not respond to an email to her personal account. Is Graff a real person? Is he a product of a pro-F-35 P.R. campaign seeking to “amplify messages across online communities”? Lockheed declined to say whether it has had any interaction with Graff, but there is reason to believe he had special access to Lockheed data on the F-35. In a post dated June 7, 2012—the same one Santucci linked to the following day—Graff laid out reams of detailed data purporting to prove that F-35 testing was ahead of schedule. In reality, the overall program was years behind schedule, regardless of any short-term surge in test flights. What’s suspicious is that the data possessed by Graff, who had appeared on the blogging scene out of nowhere just a month prior, had not appeared anywhere else online or in print. Not in Wired, Flight, Aviation Week or the Fort Worth Star-Telegram, all of which had full- or part-time reporters carefully tracking all F-35 developments. Either newcomer Graff had scooped everyone, or he was somehow privy to Lockheed’s internal data. Almost as though he had been requested—as had Bunting and the New Jersey assembly—to portray the costly, underperforming F-35 in the best possible light.